This challenging design of a picture within a leaf was the result of a class I took through the World Wide Pressed Flower Guild from an award winning pressed flower artist from Taiwan. The design concept for the class originated from a Christmas card featuring a winter scene. 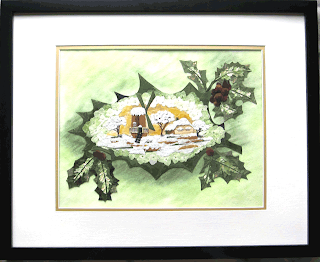 In order to meet the size requirements, both the small and large holly leaves in the design were created using pieces of multiple botanicals. Various colored skeleton leaves were used to enhance the lighting and to accent the design. Botanicals included: Poplar, holly, chameleon, lily, poinsettia and miscellaneous leaves; rose petals, straw, hydrangea, cabbage, onion skin and skeleton leaves. This original pressed flower art has been sold.